We Love to Catch Fish - Over 40 years of experience! The 1/2 day charter is either 5 or 6 hours. The morning departure is normally 7 a.m. (5 hour), 6 a.m. (6 hour). The afternoon departure is 1 p.m. for both. The 6 hour offers a little more time to catch more! A full day charter is 10 hours. The morning departure is 7 a.m.
Sunrise charter. This outing begins at 5 a.m. Enjoy a beautiful sunrise while you take advantage of the daybreak fishing frenzy. Great catches of fish are the norm on this trip. An evening charter is also available. Generally 3 hours in length with departures approximately from 5:30 to 6 p.m. A great time to enjoy a beautiful sunset along with super fishing. The 12 hour fishing special is a great way to assure yourself lots of good fishing. The 12 hours are split, enjoying 6 hours in the afternoon, then 6 hours the following morning. A very successful fish-catching experience. My recommendation for those who are serious about catching fish. Any combination of the scheduled charters or any times of your choice can be arranged on a per/hour charge. All prices subject to 5.6% Wisconsin Sales Tax. Looking for lodging in Port Washington? 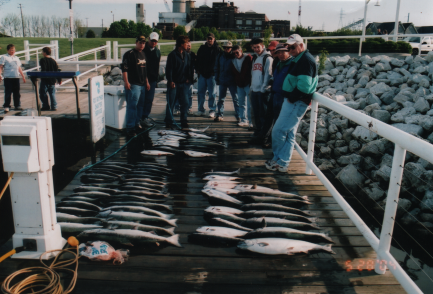 A license and Great Lakes salmon stamp is required for those over 16. Day Licenses with the stamp are available aboard our boats.